And a good Saturday morning to you, friends of LaVergne! It’s another beautiful day in our city, but especially nice for book lovers and people who want to live vicariously through the movie Lady and the Tramp. The LaVergne Public Library is holding it’s Fall Book Sale today between 9:00 a.m. and 3:00 p.m. They usually fill up the kids’ reading room with row after row of books for sale. The price? Whatever you think is “fair”! Funds raised will be used toward library programs, so stop by and show your support. You will also see activity at the corner of Murfreesboro and Stones River Roads today as a group of volunteers raise money for the medical expenses of Gary Rockhold. He suffered a brain aneurysm several weeks ago and his family is now struggling with day-to-day expenses AND enormous medical bills. If you can’t stop by and drop a dollar or ten in the bucket, come to the LaVergne Senior Center on Stones River Road between 4:00 and 7:00 p.m. for a spaghetti dinner. 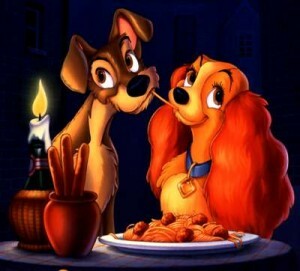 Maybe you’ll find someone you love sitting across from you and to reenact that special Disney moment! Thank you, as always, This is LaVergne readers, for your continued support of our local causes. Your big hearts are appreciated!